Between the end of my Senior Year at T.C. Williams High School in Alexandria, Virginia and beginning of my Freshman Year at James Madison University in Harrisonburg, Virginia, I played baseball in The D.C. Industrial League. Still around today, The Industrial League was quality baseball back then. The Team Rosters were filled with many talented players, some just coming out of High School and heading to University (like me); those home for the summer from Collegiate Ball--wanting to keep their skills sharp; or gamers wishing to still play--after being released from their professional teams. The Industrial League was made up of players who simply Loved The Game. It was extremely competitive. And The Summer of 1977 Arlington Chargers were no less ambitious. The Chargers were My Team. We weren't that good, but we weren't terrible either. And when The African Queen came across this photo from over 31 years past, it was just too memorable not to write about, because there is even a link to Our Washington Nationals today--in one of those Six Degrees of Kevin Bacon sort of ways. You see, The Arlington Chargers of 1977 had some celebrity--and it nothing to do with SBF. My Brother Michael was just home from his Freshman Year at The University of Tennessee. As the starting 3rd Baseman in Knoxville, he had led The Southeastern Conference in Hitting that spring. He was a hot commodity. Scouts always showed up to see him play. When he graduated from T.C. Williams High School in 1976, he was the only person in Virginia State History (at that time) to be First Team in Two Positions in the same year--Pitcher and Third Base. But Michael was far from being our only star. The Scouts ALWAYS showed up to see our Leftanded Starter too. Atlee Hammaker was home from his Freshman Year at East Tennessee State University in 1977. A two sport star at Mt. Vernon High School in Alexandria, Virginia--Atlee was as good of a basketball player as baseball pitcher. 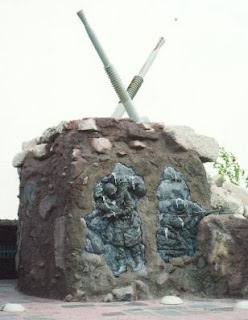 He had led Mt. Vernon to The Virginia State Basketball Championships as a schoolboy. And although he continued to play basketball at East Tennessee, his calling was on the mound. Little did anyone realize that as Hammaker dominated that summer for Our Chargers, less than six years later, Atlee would be a National League All-Star for The San Francisco Giants. And then there was Rick Vaughn. No--not THAT RICK VAUGHN from the "Major League" movies--but Rick Vaughn from T.C. Williams High School and then George Mason College. Rick was two years older than me but he and Michael and I had all played together at T.C. Williams (in fact there were five total T.C. teammates on The Chargers). In the spring of 1976, Vaughn helped to lead The Patriots (then a small commuter school in Fairfax) all the way to The NAIA World Series. It was GMC's (now GMU) first Athletic endeavor with a National Championship and The Big Time. One of George Mason's Star Pitchers, The Patriots would advance to the NAIA Playoffs all three years with Rick on the mound. Yes, The Arlington Chargers of 1977 were a pretty interesting bunch and it's why I treasure this photo so much--even after all of these years. Thanks to Sohna for pulling it out and reminding me of the good old days. 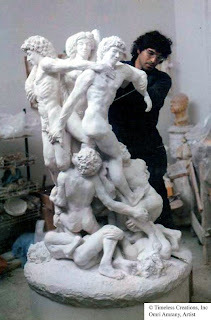 Unfortunately, Michael never made it to the professional ranks--personal problems got in the way. And although Michael never realized his dream of playing professionally--thankfully today--he is happily married with two kids--one a rising baseball star. 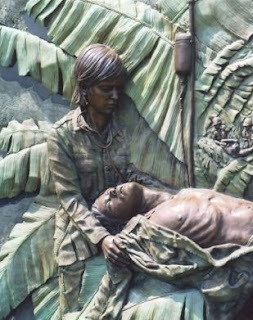 For a time, he had lost that aggressiveness, the feeling of belonging--something Atlee Hammaker NEVER lost. In all my years of playing competitive sports, never did I play alongside such a cool customer. 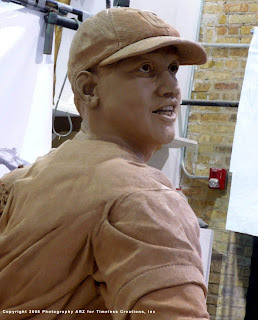 Hammaker was never fazed and the only thing that held him back in The Majors--were injuries. 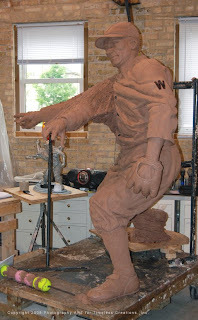 Arm ailments sidetracked what was a very promising Major League Career. Hammaker would win 59 Games in The Big Leagues, but Atlee wished he could have done more. Like extending his career, something which Rick Vaughn has done on the professional sports level nearly his entire adult lifetime--off the field of play. After his baseball playing career ended, Rick moved to sports management and relations. The Resume is Stellar. 10 Years with The Baltimore Orioles, five as Director of Public Relations--staying until 1993. Two Seasons as The Director of Public Relations for The Washington Redskins. And even a stint as TOP PR Man for The Washington Federals of the ill-fated United States Football League. 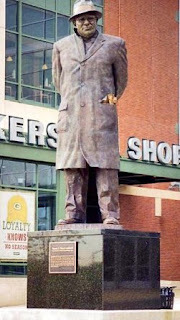 Up until 1995, Rick had worked his entire sports life in The Baltimore-Washington Market. Then in 1996, he picked up his family and moved them to Tampa Bay, returning to baseball in PR for the upstart Devil Rays. 12 years later, Rick Vaughn is still there as Vice-President of Communications for the Defending American League Champion--Tampa Bay Rays. He is one of the most respected PR Directors in the business. And better yet--and this is where Our Washington Nationals fit into the equation--Rick Vaughn and his family are very good friends with Our Radio Broadcaster Charlie Slowes and his family. For seven years, Rick and Charlie worked together for Tampa Bay Devil Rays Games. They are still very close today. Over the past few years, Rick, Charlie and I have all chuckled over the irony. Just another example of how small the world really is. The 1977 Arlington Chargers--The Picture Of The Day. In the above closer cropped photo--Rick Vaughn is second on the left in the second row. All four players directly to his left are T.C.Williams Graduates--Terry Long, Carl Hooper, Michael and me. Yes, I know it's hard to believe, but I not only had hair, but some long and flowing Reddish-Brown stuff. Amazing even for me to look at today!! And in this closer cropped shot--Atlee Hammaker is standing behind Michael and I--just over my right shoulder. Atlee Hammaker holding the runner from Struby's Mobil on 1st base--SBF manning the bag. Our home field was Wakefield High School in Arlington County, near Bailey's Crossroads and the Arlington County, Fairfax County and City of Alexandria triangular borderline. The field is still in use today as a baseball diamond. I nearly jumped out of my seat watching JEOPARDY! on television (something we don't do a lot of). The African Queen telling me to calm down. 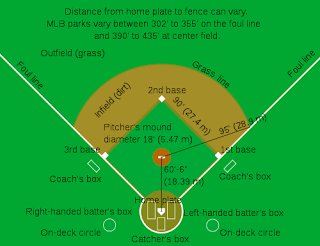 There was only one Correct Question: What is the distance between the bases on a baseball diamond? Even Alex Trebek himself had to pounce in and pontificate on this answer and question: "Yes, 90 Feet, remarkable how perfect that distance is in the great game of baseball!!" Canadian Native Alex understood the geometric simplicity and perfection of the baseball field. And when he called it "The Great Game" did I ever smile accordingly. It's my MONIKER for baseball. Yes, Mr. Trebek gets it, just like one of his contestants that answered correctly on this particular program. Of course I would like to know: Is Alex a Dodger Fan? But this moment also had me wondering again about how exactly did someone come up with 90 Feet between bases? The Best Answer: No Good Reason. In 1845, The Knickerbocker Club of New York officially paced off 42 strides from home to second base and then from first to third base to form the infield bases. If you then consider one stride being a three foot length--the corresponding distances would be 126 feet. Laid out a diamond, 90 feet would be the resultant triangle between bases (home plate to first, second to third, etc.). Not only simple, but Simply Perfect. How many times does that ground ball hit by the batter result in the fielder throwing out the runner by the typical half stride at the bag? How many times does that little extra effort by the runner result in the umpire calling safe? Every player knows how quickly he must field and toss the baseball or run to the bag. Whether a throw is coming across the infield or from the outfield, everyone, even those in the stands, knows when the play is going to be close. Just like you know when the runner is going to be out. As well as--when you know the runner is going to be safe. That 90 Foot Distance between bases allows the right amount of athleticism, and skill, to participate in the game--neither really overshadowing the other. There will always be great fielders. There will always be great runners. But none of them will ever be as Perfect as the 90 Foot Distance set between bases on the baseball diamond. When you really thing about it, the Game Of Baseball has changed tremendously over the past 163 Years of play. But from the very first days of Organized Ball--the infield distances have stayed the same. If a player from 1845 emerged today to watch the modern game--he may not know all the rules--but he would know the game being played was BASEBALL. PSS--Who wants to take a stab at 60' 6"? Why not just 60 Feet for the distance from The Pitchers Mound to Home Plate? In The History of Major League Baseball, less than 70 players have produced in the Big Leagues while standing 5'5'' or less in height. 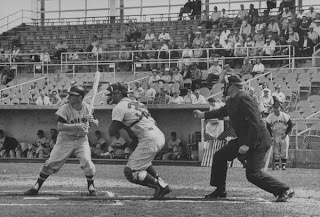 Anyone who has followed The Great Game knows the story of Eddie Gaedel--the 3'7" Dwarf that St. Louis Browns Owner Bill Veeck signed and sent to the plate in a publicity stunt on August 19, 1951 in the second game of a doubleheader against The Detroit Tigers. But only baseball aficionados probably remember Albie Pearson. Standing a mere 5'5" in height, this one-time career Minor Leaguer was traded from The Boston Red Sox to The Washington Senators, along with Norm Zauchin, for Pete Runnels in January of 1958 (in yet another case of The Senators trading away their best players in a salary dump). Albie's diminutive stature caught everyone's attention. So did the very fact that Albe Pearson could actually play the game--and well. He used his height and speed to his advantage--getting on base with walks and slap hits--while fielding a very decent centerfield. #6 on your Old Griffith Stadium Scorecard (sponsored by Briggs Hots Dogs--among many others) only weighed 141 pounds during his Freshman Season of Major League Baseball. Yet Pearson played so well, he was rewarded The 1958 Rookie Of The Year Award by The American League. Then, after a slow 1959 start to the baseball season, The Senators traded him to The Baltimore Orioles for Lenny Green--another lefthanded hitting outfielder. 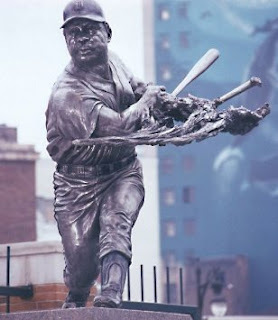 Struggling as an Oriole while playing in Baltimore, Albie would eventually be selected by The Los Angeles Angels (not the "Of Anaheim" version) in the VERY FIRST EXPANSION DRAFT ever held by Major League Baseball--in December, 1960. 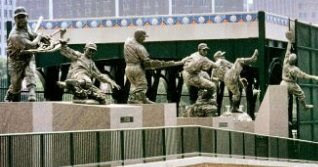 After The Original Senators moved to Minnesota--The American League expanded from eight to 10 teams by adding The New Washington Senators and The Los Angeles Angels in 1961. Lo and behold, Pearson became a star in Hollywood during the early years of The Angels. Where else? It's almost a Story Book Tale!! 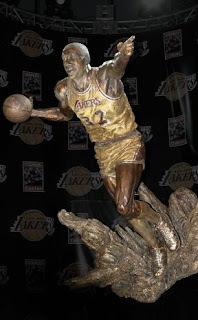 And in 1963, then Number 28 in your scorecard was named an All-Star and finished the season ranked in the MVP Voting. Although Albie would leave the game in 1966 at the young age of 31, Pearson retired knowing he may well have been short in stature, but he stood tall on The Major League Diamond. He was a pretty good ballplayer. And at least for a while, fans in Washington, DC enjoyed Albie Pearson--as A Washington Senator. PS--What's great about the above picture is first--look how both the umpire and catcher are crouching but still tower over Pearson. And second--doesn't Albie's bat look like it's almost as tall as he is? Terrific!! PSS--As a side note--in 2007, Pete Runnels was named #43 on The All-Time Boston Red Sox Players List, just after Hall of Famer Dennis Eckersley and ahead of Reggie Smith, Trot Nixon, Rick Burleson and Johnny Damon. Runnels was a really good and versatile team player himself--three times The American League Batting Champion. All three hitting championships wearing a Boston Uniform. Photo by George Silk, Copyright of Time, Inc. Seasons Greetings & Happy New Year!! 2008 has been quite the year for The African Queen and I. We spent months covering the biggest Presidential Election of our lifetime, but still made the time and effort to enjoy baseball at New Nationals Park with Our Washington Nationals. No, the Inaugural Season on South Capitol Street didn't turn out anywhere near as well as anyone wanted, but it did not take away all the fun we had watching Nats Baseball. We've been fortunate to make many friends through Baseball in The Nation's Capital. Many of whom have come to know us due to this Nats320 Blog. A passion that seems to have taken on a life of its very own. Sohna and I love attending each and every game, posting up at the charity events and the many extracurricular activities surrounding Our Washington Nationals. Then, writing all the stories. This is post number 458 for 2008. But our writings would not mean as much if not for the very fact many of you stop by on a regular basis to read and comment. Thank you so very much for letting us be a very small part of your baseball enjoyment. We are always humbled by the response. It's always good to know that others enjoy Washington Baseball as much as we do. So as this year comes to an end--whatever your choice of celebration this holiday season--The African Queen and I would like to wish EVERYONE a Very Merry Christmas, or Happy Hannukah, or A Blessed Eid, or Joyous Kwanza. Please come back and see us again in 2009. And if you see us walking around Nationals Park, or somewhere else, please stop us to say hello. We would enjoy the opportunity to meet you. When Our Washington Nationals announced yesterday afternoon the signing of five free agent players to minor league contracts, there was not a lot of buzz about these latest of invitations to Spring Training--2009. In fact, there was no reason to get excited. All of these players have holes in their games--it's why they are free agents. But two of them at least have history with The African Queen and I along with Old Section 320 at RFK Stadium. One of whom was involved in maybe the funniest unexpected moment during the three years of Nats Baseball on East Capitol Street. But first up, there is Jorge Sosa. In 2005, Sosa was a starting right handed pitcher for The Atlanta Braves. That Inaugural Season of Washington Nationals Baseball was also Sosa's finest season as a Major League Pitcher. He finished the 2005 campaign with a 13-3 mark and a stellar 2.55 ERA. On Saturday, September 10th with Washington reeling in the standings, but still in the playoff hunt, Sosa would pitch eight shutout innings at RFK Stadium on National Television. Fox Sports was carrying the game. Braves Rightfielder Jeff Francouer would save Jorge's day with a SPECTACULAR running into the wall head-first catch off the bat of Cristian Guzman in the bottom of the 5th with My Main Man!! Ryan Church on first base. Francouer JUST getting his glove on the ball as it headed over the rightfield wall and into The Nationals Bullpen (I stand corrected, Washington had yet to switch their bullpen from leftfield to rightfield). Jeff pounding the green padded wall so hard, the paneling came loose and the game had to be delayed for a repair. Surgery to the wall, not to Francouer's head, or body (This play was easily one of the best defensive catches in the three years of play at RFK. Francouer had no fear). But what made this game special was The Catching Of A Foul Ball. In 2005, I was 46 Years Old and had NEVER caught a foul ball EVER while attending countless Major League Baseball Games--not a single one. For this particular afternoon affair, we had extra seats, so Sohna and I gave our Section 320 tickets to good friends to enjoy all the camaraderie that Section 320 became at RFK. We, instead, sat in the front row on the Upper Deck, right behind the first base dugout in Section 413. In the bottom of the 7th, with Washington already down 4-0 to Atlanta, Sosa was cruising along with his shutout. Up stepped Vinny Castilla with one out. Being the first pitch swinging hitter that Old Number 9 was, Vinny swung at Jorge's very first offering. Right away, Sohna and I realized the resultant foul ball was heading right for us!! But, would it make the Upper Deck? Scared that I would fall over the railing, instinctively, The African Queen hung on to my leg as I reached over and clasped the baseball with both hands. I had caught the ball and couldn't believe it!! The usual claps of nice catch--ensued. Later, we would find out that Fox TV had caught my catch as well, replayed it, while the announcers chuckled over Sohna holding my leg. After catching the baseball, I looked down and over at all of our friends in Section 320 along the 3rd baseline at RFK Stadium. MickNats, NatsDelNegro (now called BangTheDrumNatly), SenatorNat and RallyTime!! Richard were just howling in laughter. They all knew SBF had never caught a baseball at a Major League Game before and were living in the moment with Sohna and I over the unexpected happening in seats we normally would never sit. Since that day, we've probably caught and retrieved about a Baker's Dozen Baseballs at Nats Game, but none have been as exciting or thrilling as catching that first one--thrown by Jorge Sosa and fouled off by Vinny Castilla. Still have that ball--framed in a protected case. Yes, it's priceless to me. Interestingly, Castilla is also involved in one of the funniest moments of All Time in Section 320 at RFK Stadium, although Castilla was long gone as a Third Baseman for Our Washington Nationals at the time of this incident. But, this moment was just as PRICELESS!! All thanks to Jose Castillo and The RFK Stadium PA Announcer. Now you may recall, The RFK PA Guy was named Jim Clarke. He once worked New Orleans Saints Football Games at The Superdome in Louisiana, but he didn't know ANYTHING about baseball. Consistently over the two years he worked Nationals Games at RFK, he would make mistake after mistake that you just had to shake your head about. In Section 320, we used to laugh all the time at his blunders. Later, we would find out, even The Media Guys in the Press Box had issues with his errors. And when he was eventually fired, his wife went BALLISTIC about how it was handled. On Friday Night, May 5th, 2006, Our Washington Nationals were hosting The Pittsburgh Pirates. Jose Castillo (not Castilla) was the starting second baseman for The BUCCO's that evening. In the top of the 2nd inning upped stepped the right handed hitting Jose Castillo to the batters box. As he steps in, ready to take his cuts, over the loud speaker is CLEARLY HEARD: "Now batting for The Pittsburgh Pirates, Number 14, VINNY CASTILLA!!" Vividly, I recall looking over at BangTheDrumNatly and he's giving me that "Did I hear that correctly look!!" Yeah, he did say it even The African Queen noticed the mistake. For the next inning and throughout the game, none of us in Section 320 could do anything more but laugh, almost uncontrollably, over the miscue. Mr. Clarke had made many a blunders on the PA--but that one was just too good not to enjoy. What made it even better, was The PA Announcer never corrected himself--not once. To this day, I still find myself chuckling over that incident. And when I read that Jose Castillo was signed to a Minor League Contract yesterday by Our Washington Nationals, the memory of that day just came flowing back into my head, as if it happened yesterday. That and all the fun we always had, every single game, in Section 320 at RFK Stadium. "Now batting for The Pittsburgh Pirates, Number 14, VINNY CASTILLA!!" Would it have been a nice Christmas Gift if Mark Teixeira had chosen Our Washington Nationals as his next career baseball stop? But there is no use whining over his decision today to join The New York Yankees. Because Our Washington Nationals may have lost THIS ONE BATTLE, but they may well have Won The War. Throughout the four year history since baseball returned to Washington, DC, The Media has shown little respect for Washington's Team. As far as ESPN is concerned, you better be a Yankee, Red Sox, Angel, Dodger, Cubbie or Met to feel like you actually play Major League Baseball. Everybody else is just fodder; teams to play so you can pad your winning margins and rake in all the extra money and rewards that come with success. No other teams seem to matter to the mainstream national media. Sadly, at times, it also seems our local media shares that mentality. I don't buy that, and neither should you. Are things perfect? NO!! But, the world hasn't come to an end either--especially after today. Not one single media outlet seriously considered Washington a stakeholder in The Mark Teixeira Derby. And as I wrote previously, it's unclear whether Teixeira seriously considered The Lerner's offer as well. But these past few weeks, unequivocally prove that Our Ownership Group, The Lerners, are willing to play ball!! HARDBALL, IN FACT, WITH BIG CONTRACTS. When the time is right and DC's Team needs to step up--They Are Going To Be There!! You have to give The Lerners, Our Team President Stan Kasten and Our General Manager Jim Bowden huge credit for stepping into this fray, becoming a market player and changing the PERCEPTION of a franchise in disarray. The very moment Bill Ladson over at nationals.com mentioned how he was 'SHOCKED' by Washington's offer to Teixeira, a new era had begun on South Capitol Street. Not one single mainstream media outlet considered Washington a player. Probably, not many blogs either. The Teixeira Offer by Washington certainly had EVERYONE talking Nats Baseball leading up to one of the biggest family times of the year, Christmas. The Holiday where EVERYBODY steps away from the games, at least for a while. How many of you weren't on the edge of your seat wondering of late? Could they sign him? Could Mark REALLY be interested in DC? This Soap Opera led the news, night after night over the past few weeks. For once, even during Washington Redskins Football Season, there was talk of Baseball In The Nation's Capital. Unquestionably, Our Washington Nationals have a long way to go to became the perennial winning franchise all of us so badly what to see and enjoy. But you can no longer say WE ARE NOT PLAYERS IN THE GAME. I don't want to hear how AWFUL Our Washington Nationals are, FOREVER, from the media. The same folks who decried The Tampa Bay Rays last year, The Colorado Rockies the year before and countless others before them. We may well have too many outfielders, not enough starting pitching or a solid enough bullpen right now, but Washington does have some really good talent. It's just that so many people really can't seem to see that forest before the trees. It's so true. Maybe, the best thing that has come out of The Mark Teixeira Sweepstakes is that A NEW LIGHT is now shining through the foliage on a long dismissed franchise in Major League Baseball--Our Washington Nationals. The Lerners, Mr. Kasten and JimBo lost JUST THIS ONE BATTLE. What they accomplished was setting themselves up to Win The War--in the near future. You need to report that also. PS--An Early Merry Christmas to Nick Johnson!! Our Number 24 maybe The Biggest Individual Winning Stakeholder in getting back playing time for Washington over Teixeira choosing The New York Yankees today. Sohna and I love NJ and we are happy to see Nick possibly getting a deserved chance to return and play a healthy first base for Our Washington Nationals in 2009. If make-up means a lot, and Teixeira supposedly has it, well Nick's had make-up too, like for his entire Major League Career. He's proven that, countless times, both on and off the field of play. That man's a winner--and The African Queen and I will never give up on him. Hopefully, Our Washington Nationals will not as well. Click on any photo to expand and enlarge. Picking up where we left off yesterday, Omri Amrany of Timeless Creations, Inc. and I are talking about his life's work in The Arts. 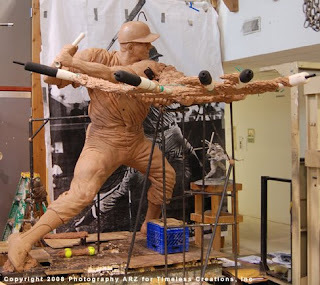 Today, in the final chapter, Mr. Amrany discusses in greater detail, his current work producing the three statues of Walter Johnson, Josh Gibson and Frank Howard for The DC Commission on The Arts & Humanities. 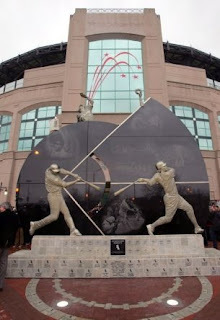 This White Bronze Trio to be unveiled at Nationals Park in Spring of 2009. Today's journey will include a series of photos of all three pieces in some stages of production. As I mentioned yesterday, and will remind everyone again today--none of these works are fully completed until the unveiling on South Capitol Street. Changes, tweaks and modifications are made throughout every step of the process. With that, here we go with The Final Chapter With Omri Amrany. “Some people come in from different directions and they want to see a figure standing on a base, very well respected looking. They have a fear that if you do something different there will be criticisms against it. 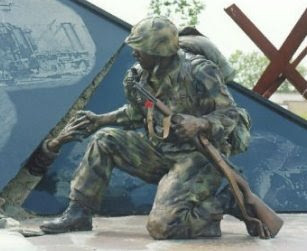 Isn’t the art made to be created and thought about? If you create art, it’s to make people think. And sometimes the feedback is not so positive. 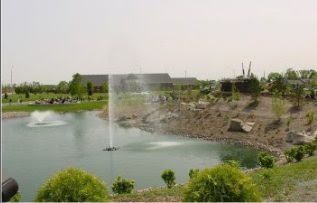 You have to say OK. We’ve had a lot of responses (from the families), some different wishes." 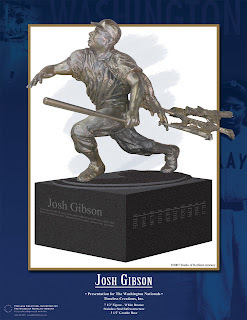 "I think that Sean Gibson (Josh Gibson's Great-Grand Son) was very much contemplating the sculpture of Josh Gibson and agreed that everything is there. We got it." “You are perfectly right about that. I can honestly say that after looking at the initial concept, clients will say: ‘Let him go with that. Let’s see where he is going.’ Look at the pieces of The Red Wings, how the effect between the bronze, the glass and the 4th Dimension and the energy of form all work together. No doubt it’s also why you see them all over the televisions in the State of Michigan. It’s a proud billboard and statement for this team all-around. 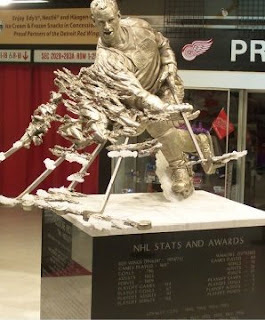 They have become a cultural effect (The Detroit Red Wings)." “Yes, I knew that. I talked with him briefly one time. 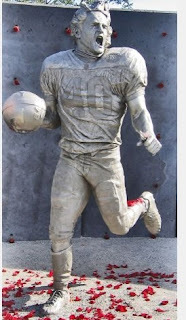 The bases for the statues, what are they made of? (Andy) They are laser etched in granite and the copy is being written right now through Frank. Sean Gibson and Hank Thomas (Walter Johnson's Grand Son) have weighed in on what they would like the copy to read. With those final words, My Conversation With Omri Amrany concluded. 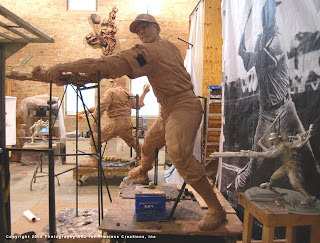 For nearly 90 minutes, Omri and Andy had taken the time to discuss with Nats320 the details about Timeless Creations Inc.'s work, and their efforts to honor three of Washington's Baseball Greats at Nationals Park in 2009. No one had sat down before to speak with Omri about his current efforts for The DC Commission for The Arts & Humanities. 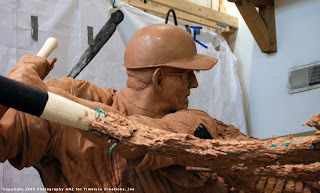 And how very exciting to know they, along with The DC Commission on The Arts & Humanities, were going to allow Nats320 to display some photos of The Statue Work In Progress for Fans of Our Washington Nationals. Again, many thanks to Gloria Nauden, The Executive Director for The DC Commission on The Arts & Humanities who was very receptive to my original ideas for this conversation. And to Rachel Dickerson, The Arts In Public Places Manager for The DC Commission on The Arts & Humanities who made all the contacts, put Omri & Andy together with me while setting up the interview. Finally, thanks to Andy Rotman-Zaid (Project Manager for Timeless Creations, Inc.) for his tireless efforts to assist in any way possible to make these posts happen--even while stuck in a snow storm and walking in snow shoes--IT's TRUE! !--and Funny--especially when he speed dialed me accidentally looking for directions--thinking he was talking to someone else. It was a great laugh!! And of course, Omri Amrany, who was as devoted and engaged in speaking with me for this chat as apparently he is with his everyday artwork. Omri really got into the discussion and I appreciated his enthusiasm--tremendously. 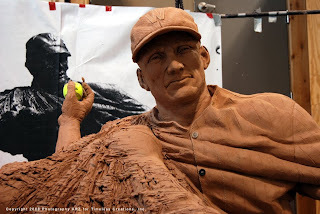 Hopefully, all of you, Our Nats320 Readers, enjoyed the interview and the working pictures of The Statues of Walter Johnson, Josh Gibson and Frank Howard. PS--Andy also told me that My Favorite Player Of All Time! !, Frank Howard, has been his usual self-deprecating self. 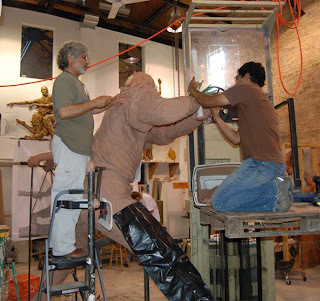 "Hondo" has turned down all offers to come to The Fine Art Studio of Rotblatt-Amrany to see the works in progress. 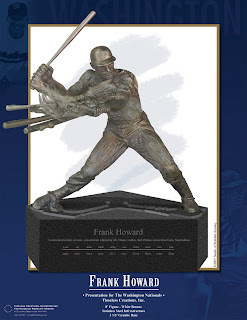 As usual, Frank Howard says he is touched anyone would consider "Honoring" him. Unless otherwise noted: all photos are copyright protected by Timeless Creations, Inc. and The Fine Art Studio of Rotblatt-Amrany. 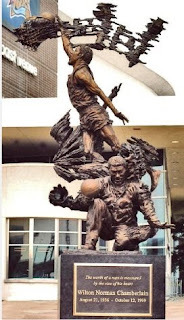 Michael Jordan, "Magic" Johnson, Wilt Chamberlain, Harry Caray and Gordie Howe--Icons of American Sport. Each a Hall of Famer in their own right. 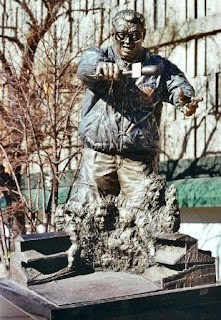 All of whom have been immortalized in bronze by Omri Amrany. 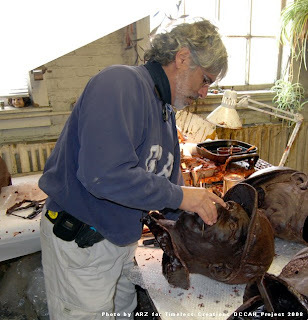 Mr. Amrany, an Israeli-Born American Citizen, is a world renown artist. 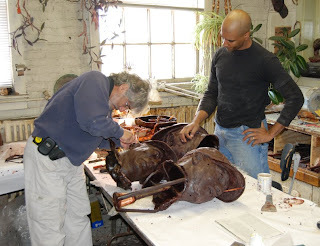 Well known for a plethora of work in various mediums, but especially those of Bronze Sculpture. 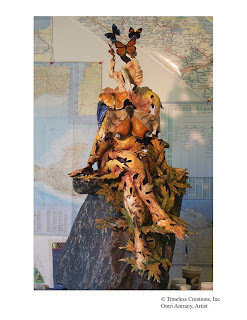 Teaming with his wife, Julie Rotblatt, Omri, runs The Fine Art Studio of Rotblatt-Amrany in Highwood, Illinois. A not for profit studio for artists in training to Master their crafts. 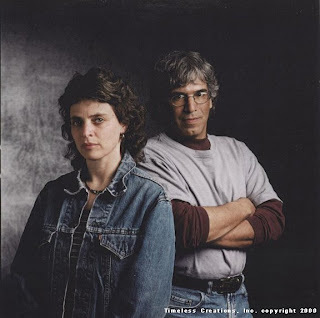 Additionally, Ms. Rotblatt and Mr. Amrany operate Timeless Creations, Inc--the commercial side of their business--which includes bidding for commissions around The United States of America and abroad for Civic & Sport related artwork. 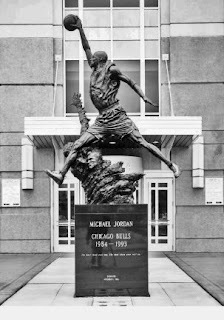 Over the years, both Julie & Omri have completed commissioned works honoring The Detroit Tigers, The Detroit Red Wings, The Green Bay Packers and even The Chicago White Sox, among many others-although sport related commissions are far from all they have been honored to produce. And I am happy to say I was personally familiar with much of their sports work. Which brings us all to the point of this two-part story. 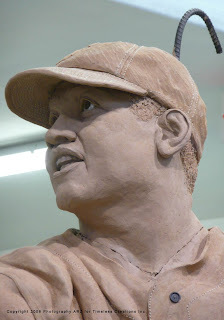 Omri Amrany and Timeless Creations, Inc. bid on and successfully won the rights to produce the three statues of Washington's Baseball Greats at Nationals Park in Washington, DC. 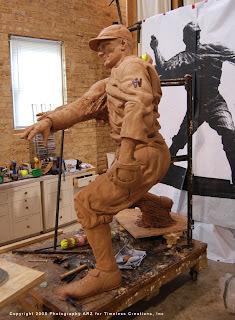 Yes, Omri is producing all three of those much awaited bronze pieces of Walter Johnson, Josh Gibson and Frank Howard. 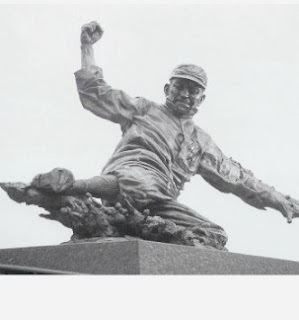 The DC Commission on The Arts & Humanities granted Mr. Amrany the contract to develop, produce and ultimately honor three of DC's Most Favored Baseball Son's in Centerfield Plaza at The South Capitol Street Ballpark. 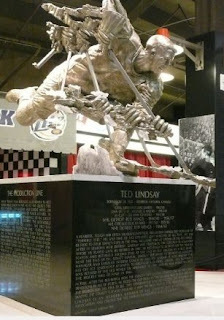 The induction ceremony to take place some time this coming Spring of 2009. 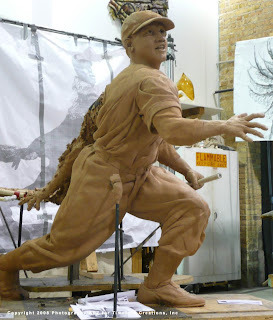 But I would imagine that most every fan of Our Washington Nationals has wanted to peek at, get a glimpse of, what might be in store for their baseball viewing pleasure come Year Two of Nationals Park. Well, I am also happy to write that everyone is going to get their first opportunity right here. Yes, thanks to Gloria Nauden, the Executive Director of The DC Commission on The Arts & Humanities; Rachel Dickerson--The Arts In Public Places Manager for The DC Commission on The Arts & Humanities; Andy Rotman-Zaid, The Project Manager for Timeless Creations, Inc. and Omri Amrany himself, Nats320 is going to take a inside look at what's in store for all Washington Baseball Fans this coming year. This effort was a long time coming and included a tremendous amount of background work on Nats320's part. No, this was no small task. First, we begin with the in-depth look at Mr. Amrany. This is time to get to know your artist. 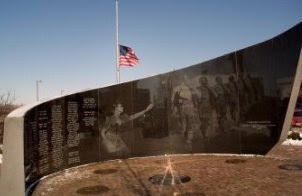 The man granted the contract to honor Our Stars. A few weeks ago, Omri and I talked for some time on the phone in an interview set up by Ms. Dickerson. Andy Rotman-Zaid and I conversed on more than a couple of occasions, beforehand, to make sure everything worked out well. And have continued to stay in touch many times since. In fact, Andy provided most of the photos for this series--his assistance has been immeasurable. Fortunately, the timing couldn't have been better, as all three pieces of Johnson, Gibson and Howard are at a development stage where they are all beginning to come to life. But, I want to remind EVERYONE, no piece of artwork is fully completed until the unveiling. Throughout every step of the process, changes and modifications are being made to enhance the final work. Today, in Part One, the conversation will be about Omri Amrany--his background, his thoughts, what he looks to accomplish each and every time he challenges himself on a work of art. Mr. Amrany is a very interesting man. We talked for nearly 90 minutes, both of us engaged in the chat. 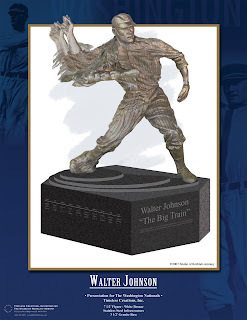 Then, in Part Two, Omri & I will concentrate on his work of Walter Johnson, Josh Gibson and Frank Howard. 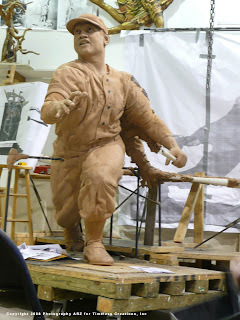 At that time, pictures will be released, exclusively here on Nats320, for the first time showing the sculptures in progress. Unquestionably, everyone will get a good idea of what to expect in Centerfield Plaza at Nationals Park in 2009. With all that background now behind us, here's Part One of My Conversation With Omri Amrany. “Well sport is a part of life, I think one of the strongest elements that intrigued me coming to The United States and becoming a U.S. Citizens—if you look at World War II—this country was in a depression and used all their elements to create sports around which people would follow as a part of their lives. They became the fans of the sports, much like today. But back then, it meant a whole lot more to their lives. Every kid was in the sports field. They played the game. What you have here is a Western Society that in an ordinary way would not master the physical unless they were doing sport." “Am I always happy with my work? No, not always. But mostly, I will try to push myself to the maximum. That’s a very good question. When I do my personal artwork, I may not finish it and the public will never see it. But I push the limits. I push the envelope to the limit. And it’s also one of the biggest complaints I get—from the manufacturer--the foundry, the electroformer, anytime that we push the limits. Julie and I push to the max for everything we create. It sometimes makes it very difficult for one side, but the reason why so many sport teams fell in love with our work is because when they look—our pieces Fly The Best." That concludes Part One of My Conversation With Omri Amrany. Hopefully, you now have come to know Mr. Amrany and his work. 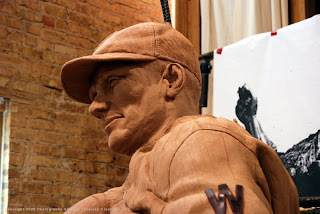 Because tomorrow in Part Two, The Final Chapter With Omri Amrany will include exclusive photos of The Walter Johnson, Josh Gibson and Frank Howard Statues in production by Timeless Creations, Inc. Note on Fractal: A fractal is generally "a rough or fragmented geometric shape that can be split into parts, each of which is (at least approximately) a reduced-size copy of the whole," a property called self-similarity. The term was coined by Benoît Mandelbrot in 1975 and was derived from the Latin fractus meaning "broken" or "fractured." A mathematical fractal is based on an equation that undergoes iteration, a form of feedback based on recursion.